Monmaya Sonar from the Arunachal Pradesh earned the praise of Prime Minister Narendra Modi for her immaculate artwork on Swachh Bharat Abhiyan. PM Modi also shared her drawing on twitter. On Wednesday, Modi tweeted the painting done by Monmaya Sonar, a student of Arunachal Pradesh, on the topic of Clean India Mission. 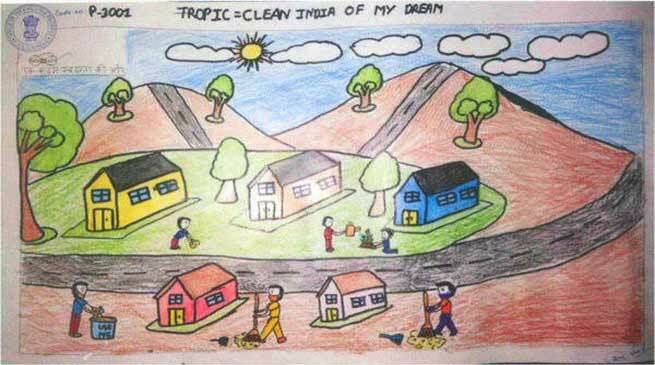 “Monmaya Sonar from West Kameng, Arunachal Pradesh won a prize for this artwork, in which she has illustrated a Swachh Bharat. @swachhbharat,” tweeted Modi. Monmaya took part in the Swachh Bharat Art Competition held all across the country and managed to impress Modi. Modi mentioning the artwork also said that this kind of work would inspire more people to participate in the Swachh Bharat Abhiyan. Chief Minister Arunachal Pradesh, Pema Khandu also congratulates Monmaya sonar in his tweet. On the micro-blogging site on Monday, Modi also thanked people who took part in cleanliness activities and other social initiatives on Sunday (September 17), which was also the PM’s birthday. Modi’s birthday was marked as Sewa Divas (Service Day) on Sunday and several Bharatiya Janata Party (BJP) leaders took part in cleanliness drive across the country.